This is very similar to my previous post Blue-Lotus-Diamond-Sutra-Quote . It has a Buddha statue, a Lotus and a Quote from a Sutra. Not to say it is from the same website. Try to find the link in the wallpaper ! The Lotus is a white lotus (Pundarika), which looks yellow due to the gradient effect. The Sanskrit Title of Lotus Sutra reads “saddharma puṇḍarīka sūtram – सद्धर्म पुण्डरीक सूत्रम्” – which can be translated to the English as “Sutra on the White Lotus of the Good Dharma”. 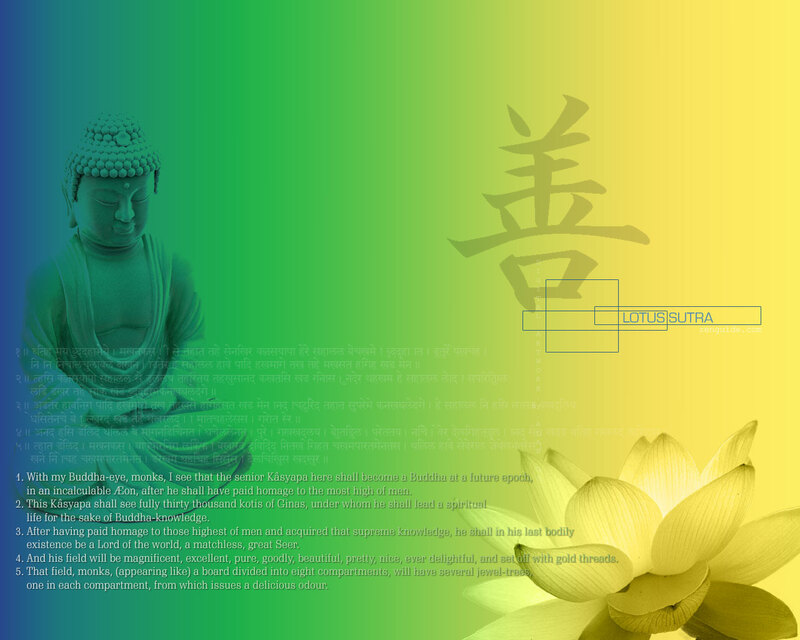 But for the color gradient, the white lotus denotes perfectly denotes the sutra ! The choice of color gradient is sort of strange not completely bad though. Though I would like to know, why they chose such an odd color combination. The Wallpaper also has Devanagari text which is placed above the English text. Atleast in the Diamond Sutra, they tried to type something similar to the original Sanskrit. This Lotus Sutra text is complete rubbish !!!. It is just used to give it an “Indic” feel so as to say. I dont understand, why the heck, do they want to include rubbish. The Original Devanagari version follows later in this post. Also, there is this big chinese character thingy 😉 on the wallpaper, I just dont know what it is !. If you guys know what it is, post a comment !! In the following verses, the Lord predicts Buddhahood to his discple Mahakashyapa, which He sees using his Buddha-eyes (Buddhachakshus बुद्धचक्षुस्). The Wallpaper has a rough English translation of these verses. Time for another wallpaper of mine ! The Plain Wallpaper has the face of the Buddha imprinted on one of its petals. This wallpaper was lying in my PC in some folder, just came across it some time ago !. 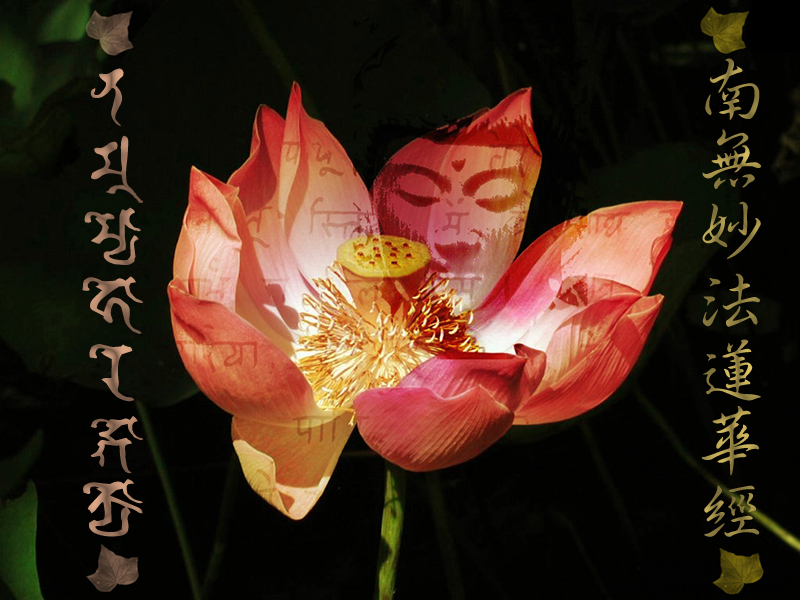 The figure of Buddha in the Lotus, reminded me of the Lotus Sutra. 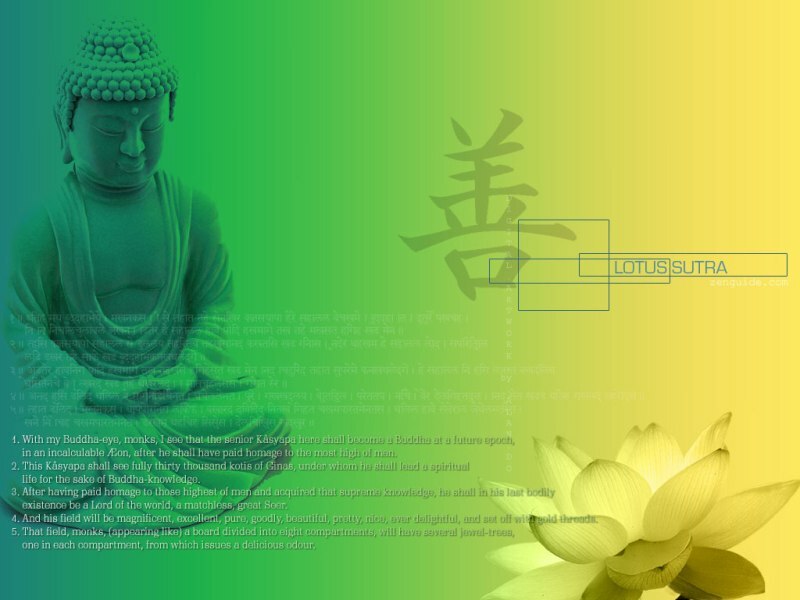 Upon thinking of Lotus Sutra, the next thing that came upon my mind was Nichiren Buddhism, along with its associated chant “Nam Myoho Renge Kyo” – The Daimoku – Homage to the Lotus Sutra. So, I thought I would spice up the wallpaper with some calligraphy as usual 😉 . Back to the chanting. The Daimoku – “Nam Myoho Renge Kyo” is a japanese chant, which means “Homage to the Lotus Sutra” as said earlier. It is to be noted, though this is in Japanese, it qualifies as a Mantra. Because it was expounded by Nichiren, and as all Mantras, they are to be chanted as expounded by the Master. And there are a lot of theological, character by character explanation of the Daimoku. But, I was actually thinking to render the chant in Sanskrit as “namaḥ saddharmapuṇḍarīkāya sūtrāya – नमः सद्धर्मपुण्डरीकाय सूत्राय“. i.e [Homage] [to Saddharmapundarika] [to Sutra] – I know it sounds wierd. But Sanskrit works this way, no other go ! 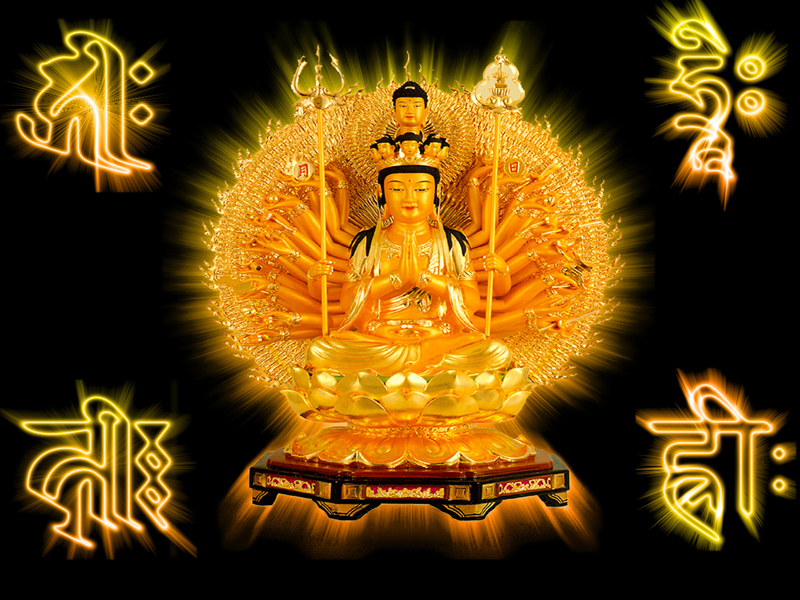 Namo Avalokiteshvaraya Bodhisattvaya Mahayasattvaya Mahakaruniya – [Homage] [to Avalokiteshvara] [to Bodhisattva] [to Mahasattva] [to Mahakarunika(Great Compassionate one)] i.e Homage to Avalokiteshvara, the Bodhisattava, Mahasattva, Mahakarunika ! When I realized the above, I thought it would be more proper to the transliterate the chant in Siddham as – “nam myoho reṅge kyo – नम् म्योहो रेङ्गे क्यो“, rather than translate. So thats what I exactly did in the wallpaper. Also, if there were any Buddhist sect that couldn’t have had any existence in India, it is Nichiren Buddhism. Because by 13th century virtually Buddhism was extinct [got fused with Hinduism in one sense] in Indian Mainland. So, Even a back propagation to India would have been completely impossible. Consequently, a Sanskritized version of the chant, would not have existed at all ! . But it was not the same in the case of Pure Land Buddhism etc, there were definite sanskrit precursors to them. The Nembutsu/Nienfo would have had a clear Sanskrit precursor “namo’mitābhāya buddhāya नमोऽमिताभाय बुद्धाय“, due to the existence of the Indian Pureland Tradition. So, It would be completely unwise to render it in a Sanskrit Translation, hence I rendered that chant Nam Myho Renge Kyo phoneticaly as it is in Sanskrit as < नम्‌ म्योहो रेङ्गे क्यो > . You can see the Siddham Version of Daimoku on the left, and the Kanji version in Brush Style to the right [Both Font based]. Speaking of Nichiren, it is interesting to know, how chanting the name of book had gained such a huge popularity in East Asia. Some one pointed out in E-Sangha that this is purely an East Asian phenomenon and not Indian. Its so true, even though India as lots of sects with all their associated literature, I have never heard any one chaning “Namo Vedaya’ or “Namo Bhagavadgitaya” or whatever ! . Even though various texts themselves claim that even saying the name of it, is equivalent to reading it. & Many modern religious speakers also make a similar point in their lectures. It was understood more as a Rhetorical Point, to show the importance and authority of the Text. It was never understood literally [atleast to the Indians]. But Nichiren was so convinced of the Lotus Sutra’s efficiency and authority as the ultimate Dharma taught by Shakyamuni Buddha, that he literally thought chanting the name of the sutra, would lead to salvation. Though it is said the daimoku was chanted in the secrecy by the TienTai sect long before Nichiren, but it was Nichiren who openly advocated the Daimoku. Anyways, all of the 84,000 dharma doors are effective. Each is one is aimed at a difference individual, based on his capacity . !!! Homage to the Lotus Sutra !!!! It has been a while, since I designed by own wallpaper. I learned a few tricks in photoshop, so I kinda over did them here :). The Wallapaper has the Eleven Headed Thousand Armed Thousand Eyed Avalokiteshvara (ekādaśamukha sahasrabhuja sahasranetra avalokiteśvara – एकादशमुख सहस्रभुज सहस्रनेत्र अवलोकितेश्वर ). I think this term doesn’t mean He has exactly Thousand Eyes and Arms, it means more or less like “Thousands of” Arms, and “Thousands of Eyes”. In the Karandavyuha Sutra, Avalokiteshvara enters the Avici hells, to save the beings there. He converts the fire pits into cool refreshing pools, and makes the Avici Naraka – The most Painful and lowliest Hell – a very nice place !!. The Guardians report this to Yama. Yama wonders whether the being who had done such a transformation, was “Shiva”, “Vishnu”, a “Rakshasa” or some other supernatural being. When seen through his divine eyes, he finds Avalokiteshvara Bodhisattva Mahasattva there. Surrounding the Vishvarupa (विश्वरूप – Great Form) of Avalokitesvara, his seed syllable hrīḥ – ह्रीः is placed around the four corners, in four different scripts. 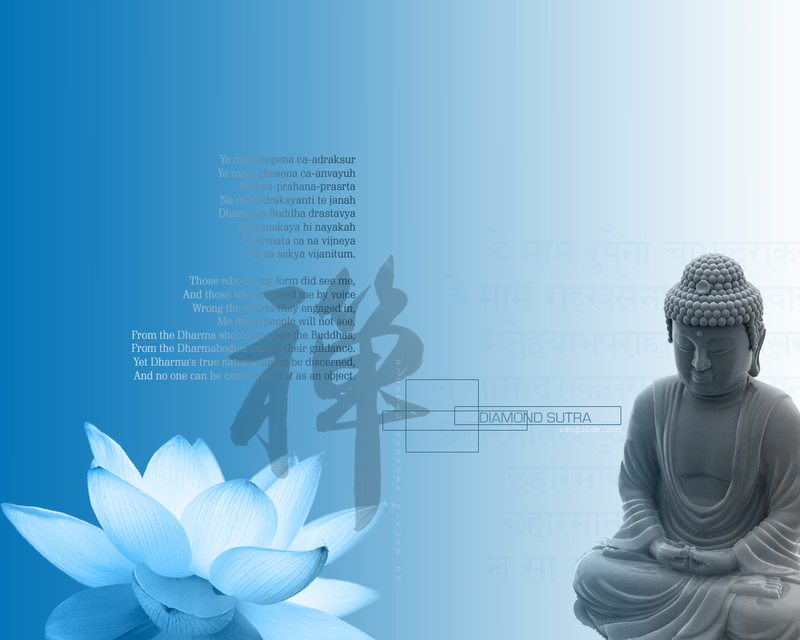 All those play a very important role in Mahayana Buddhism. BTW, I have written more abou the Seed Syllable hrIH here: Seed Syllable of Great Compassion in Lotus . 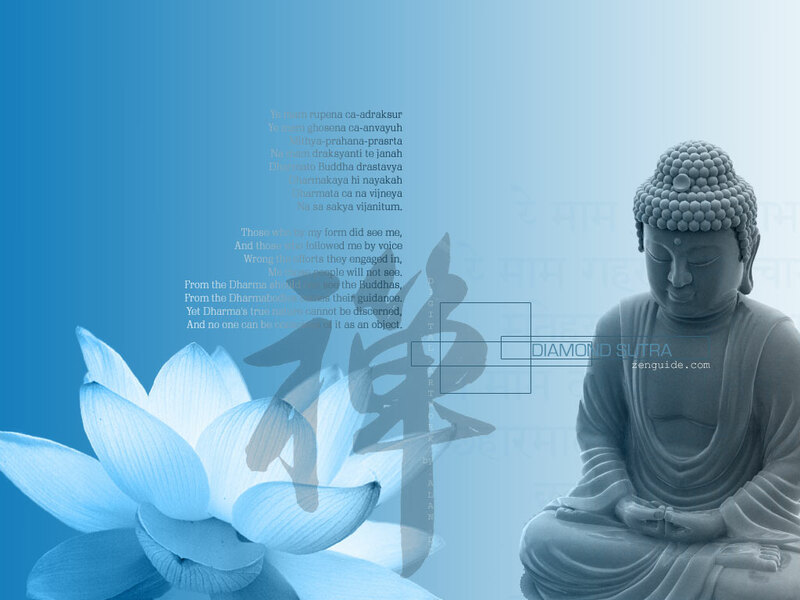 Siddham script is a very important script in Sino-Japanese Buddhism. It is used to write Sanskrit Mantra/Dharanis and Mandalas. Bottom Left – hrīḥ in Ranjana/Lantsa Script. It was quite difficult to find the hrIH in Ranjana, as there is no proper ranjana font. It was also difficult to find out the shape of hrIH in Ranjana. Visible Mantra had one form of hrIH in Ranjana, but I couldn’t make this form using the incomplete Ranjana font, that I had. A bit of googling, I got this – Unicode Proposal for Ranjana Script. This had a form of <<hra>>, from which I could create using the font. From <<hra>> adding vowel markers to create <<hrii.h>> was relatively easy. Bottom Left – hrīḥ in Devanagari Script. I have nothing more to add about Devanagari Script. It has become a standard script for Sanskrit these days. For its connection with Mahayana Buddhism, I guess it is used to write Sutra/Mantras/Dharanis in Newari Buddhism in Nepal. Aah.. 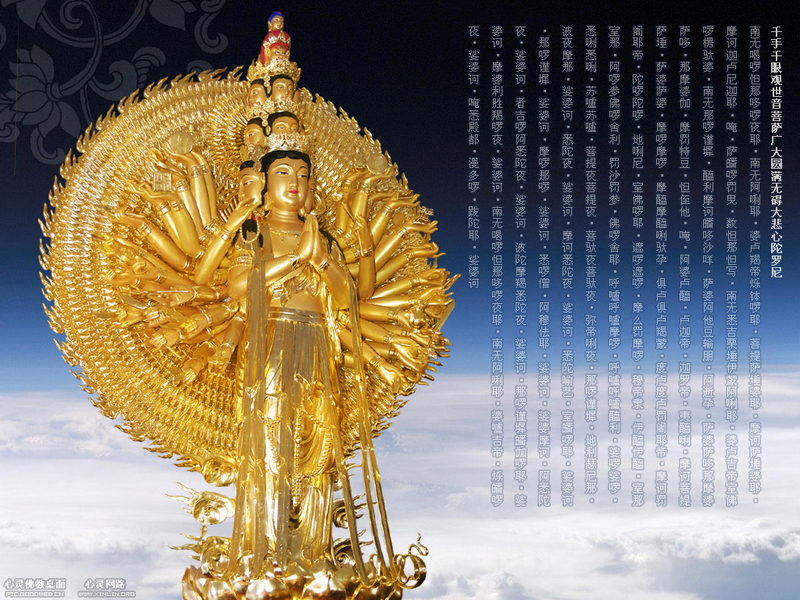 Yet another Thousand Armed Avalokitesvara Wallpaper with the Great Compassion Mantra beside it 🙂 . The Golden Statue of Avalokitesvara is standing on a Lotus with all the usual aspects of His thousand Armed Form. 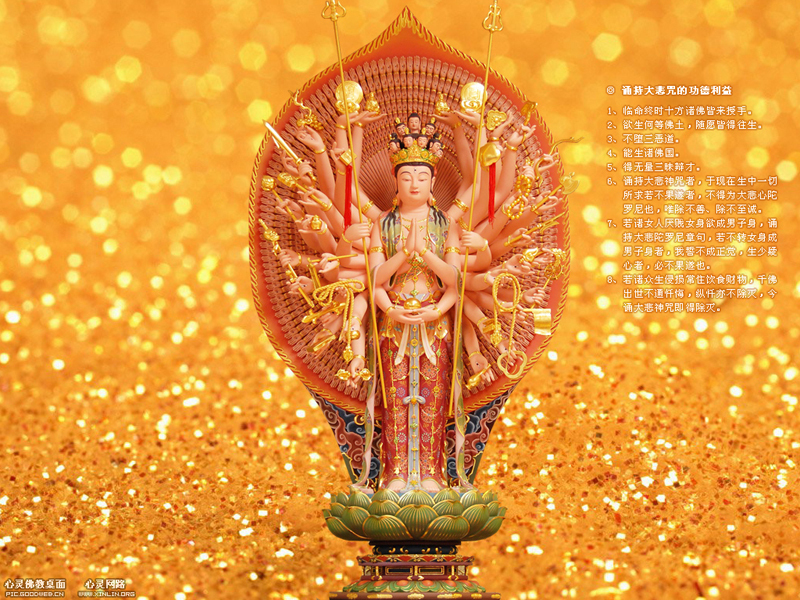 However campared to the previous wallpapers, the Eleven heads are arranged in five layers ( 3 + 3+ 3 + 1 + 1), the last eleventh head, being the head of Buddha Amitabha. Check out the Category for more “Thousand Armed Avalokitesvara” wallpapers.